Most of the Olympic athletes and delegates tonight sported street-smart winter gear. A lot of it will be wearable after the games. Not so the tacky garb of Team USA. A good thing they were on the back-end of the parade of nations. It was no great feat to see how hideous those über-busy sweaters are. Hide, USA! Outside the secure area, they make for easy targets. Despite the fact that the cardigans are supposedly sold out, I can’t imagine them having any long-term aftermarket value. They won’t last, for one. The boots, on the other hand, look nice. Is it an uncanny coincidence that this fashion faux pax is a metaphor for how fragmented this country has become? The cardy is a granny quilt of feuding red and blue states squares and poorly placed verbal messaging. Has anyone counted the stars, or are they just filler? Our uniform was a chance for us to shine for two weeks. Instead, the US Olympic Committee sacrificed our brand to another big ego. Made in the United States. 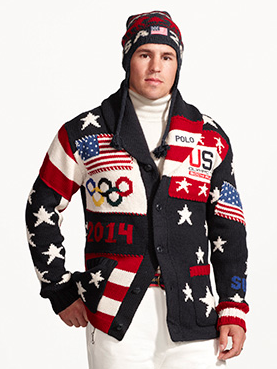 The USOC should have selected a new designer to outfit this Olympiad’s competitors. Ralph Lauren had his chance — two, in fact — in Vancouver’s 2010 Winter Games and in Beijing’s 2008 Summer Olympics, He and his company blew both, showing everyone his lack of patriotism by choosing earnings over authenticity. Commerce over craft. Profit over pride of country. There was quite the public outcry when it was revealed that some (perhaps all?) of the official 2010 clothing was, in fact, manufactured in China. New blood needed. As this global event so often launches athletes into stardom, the USOC could have gotten into the spirit and had the same effect by jumpstarting an aspiring artist’s career. The US has many young, yet sufficiently established designers who could have seamlessly delivered. Style, that is. Context-current, up-and-coming craftspeople who would not have taken the honor for granted. Alternatively, the The North Faces, Nikes and Patagonias could have produced something tasteful and desirable. If the USOC really wanted to get people excited about sports and attract new generations of participants and viewers, they would have signed on a Bruno Mars. Instead, what can only be aging members went with the obvious. It showed, and we deserve better. Polo, formerly called America. As if the choice of designer weren’t bad enough, the design itself chokes. It looks committee-driven; no consensus could be reached, so a mash-up it is. The Polo word mark on the lapel is over and above the USA. In close-up shots of the athletes, that’s all you see, with part of “USA” tucked in the armpit. This placement says it all about what Mr. Lauren thinks of himself. On no other team’s outerwear did a clothing brand compete with the country name. If I didn’t know any better, I would have thought that Polo was a country. In 2010, things were better in that the Polo brand mark, the polo player, was blazer front and off-center (too far off). That alone should have been a red flag. Off-fabric. Please…, cotton turtlenecks? I bet the bulky sweaters are also cotton. There are so many technical and new wool fabrics out there to keep you warm and looking good. Thin layering devices that perform! Nice departures. Of note: some countries (France, Germany, Iran, Japan, Latvia, Lithuania and New Zealand) whose jackets and pants had nothing to do with their flag color. The Japanese carried small Russian and Japanese flags. And looks like the Russian women got to pick between red, white and blue parkas! Tonga’s coats-as-canvas combined the vertically placed flag along with an ocean and palm background. Well done! McKayla, love your daring acrobatics. Keep on flying!